Till now, we have been converging on the point where we can put some kind of parameters, if not a definition, to the work of the fous littéraires. First we looked at examples of what is considered definitely not in this category. Then we examined a few cases of fou but without analysis. Next we looked at one particular case, Roussel, with some analysis of his methods, as presented by himself. Lastly, we have just studied the genre of literary nonsense, which, though a close cousin, may nevertheless be distinguished as a different kind of linguistic activity. The time has come to examine why nonsense differs from fou-work, and thus what exactly constitutes this strange practice, at once literary, philosophical, and experiental. As Jean-Jacques Lecercle, a linguist and literary scholar who specializes in this field, shows in his excellent guide, Philosophy through the Looking Glass, Antonin Artaud’s “Jabberwocky” is the best place to begin the task. 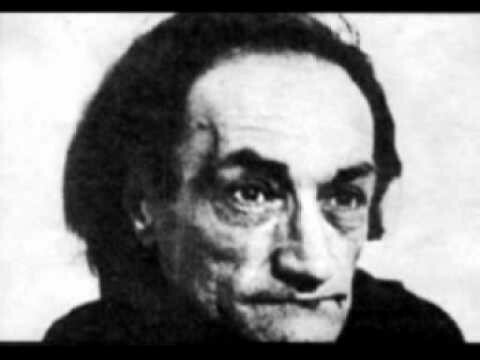 Antoine Marie Joseph Artaud, better known as Antonin Artaud was a poet, essayist, dramatist, actor, theatre director, and author of the manifesto for a Theatre of Cruelty. Both a member of the European avant-garde, and sometime intern of asylums, he is considered a key figure in certain strands of aesthetic Modernism. Here, however, we shall only be concerned with his specific and direct relationship to the genre of literary nonsense, as exhibited in his translation of the “Humpty Dumpty” chapter of Through the Looking Glass, “in which the eponymous philosopher-egg engages the adventurous [ ] Alice in a lively conversation on the topic of...language...via an impromptu exegesis of the enigmatic poem "Jabberwocky,” (“The Asylum of Nonsense: Antonin Artaud's Translation of Lewis Carroll, “Alexandra Lukes, The Romanic Review, January-March 2013). Artaud undertook this work when it was assigned as a therapeutic activity by Dr. Gaston Ferdiere, his physician in the asylum at Rodez where he was confined from 1943-46. This was “part of a series of experiments used by Ferdiere to study the relationship between linguistic dysfunctions, literature, and medicine, the results of which he then published in an article entitled ‘Les Mots-valises’ in 1948,” (ibid.). Ferdiere believed that along with shock therapy such activities could help patients whose pathologies included alterations in their speech and sense of self, as was the case with Artaud. The piece the poet eventually produced is called “L'Arve et l'Aume.” As its title suggests, it is far from a conventional translation, nor, as Lukes points out, does it suggest any success in “curing” Artaud’s linguistic excesses, quite the opposite, for it is here that some of his most famous stylistic motifs make their most sustained appearance. Whilst Carroll uses the figure of Humpty Dumpty to stage a debate over whether a speaker can really master language and make it mean what s/he intends, at a certain level, he does not take the issue seriously, for the scene, along with the entire narrative in which it is embedded, is ultimately revealed as nothing but a dream. As letters to Henri Parisot, the author of the standard French translation of the Alice books, show, Artaud “was extremely resentful of this lack of seriousness,” calling Carroll “a castrated, half-caste hybrid who ground consciousness like coffee beans to get a text out of it,” and “a coward who did not want to suffer for his work,” (cited in Philosophy Through the Looking Glass, J-J. Lecercle, p. 32). Indeed, the title already reveals his attitude, having as a sub-heading the provocative phrase, “Tentative anti-grammaticale a propos de Lewis Carroll et contre lui,” (ibid. ), or “a tentative anti-grammatical enterprise on Lewis Carroll and against him.” Less a translation than an attack, “L'Arve et l'Aume,” massacres Carroll’s text. Furthermore, the “translator” feels entitled to his anger and rewriting for, as he says to Parisot, ”Jabberwocky is a bowdlerized plagiarism of a work which I wrote but which was suppressed so that I hardly know myself what was in it,” (Antonin Artaud: OEuvres. Edition etablie, presentee et annotee par Evelyne Grossman. Paris: Gallimard, Quarto, 2004., p. 927, cited in Lukes, 2013.). In Artaud’s eyes, Carrol’s text was no more than a transcription, while his own translation was a piece of creative writing. Artaud’s point is that Carroll leaves out of his discourse the link between language, body and pain. Prior to his attempt against the “Jabberwocky,” Artaud’s version of the chapter is fairly straightforward, with only slight deviations. However, these are highly indicative. Firstly, he inserts his own portmanteau words in places where they don’t exist in the original. For instance he translates “clearly” in the first paragraph with “intropoltabrement,” a coined word that still conforms to the phonotactic rules governing French. Slightly later he converts the word “gently” into the coined word “griliment,” which has all the suggestion of the opposite, not gentleness, but aggression. The harsh “g” and “r” sounds continue to proliferate at the end of sentences, causing whole phrases to sink into incomprehension; “Hoping to turn her remark into a sort of compliment,” becomes, “us reste de ce su-Turlet si bien rilé et riptionné,” (ibid., p. 33). At one stage Artaud has Alice call Humpty Dumpty a “tapette,” or queer, something the very proper Carroll would never have done. The attacks here take two forms, sematic addition (the adding of new, usually coined words), and phonetic proliferation, as though the text were beginning to growl and roar. As Lecercle says, here “Carroll no longer speaks in his text: nor in fact does Artaud. The text speaks for itself,” (ibid.). But if the text proceeds as a mixture of translation and disruption, when it reaches the Jabberwocky poem itself, all semblance of ordered transcription are thrown to the winds. Contrary to appearances, a poem like “Jabberwocky” is not difficult to translate, so long as the translator can coin convincing portmanteau in their own language. Excellent translations exist in myriad languages, including French, German, Latin, Greek, Hebrew, Yiddish, Esperanto, and even Klingon. Below are the first two verses in French, by Parisot, and Klingon, by Kim Lim, (see http://www76.pair.com/keithlim/jabberwocky/translations/). Instead of one, we have multiple coined words as language proliferates on its own, guided by its own rules; of “rhyme, including internal rhyme, syllable count (eight syllables per ‘line’), and caesura,” (PttLG, Lecercle, p. 34). Though none of these words are possible French words, they seem to have their own internal consistency, with “ a definite system of phonetic dissemination,” (ibid.) in which throat choking guttural consonants abound. It is as if Artaud has discovered/invented his own language. Or, better, as if a (new) language has found him to possess. ratara ratara ratara atara tatara rana otara otara katara otara ratara kana ortura ortura konara kokona kokona koma, (OEuvres 1015-16), (Lukes). What Artaud has in fact discovered, according to Lecercle, after Deleuze, is that there are always two languages; a surface language of communication governed by social conventions, where phonotactic and syntactic order reign, and another “language of the depths of the body, where the articulate word becomes a scream, [and] where only affects and the passions of the body can be expressed,” (PttLG, Lecercle, p. 35). Thus, there are also always two masters, the speaker, who dominates on the surface, and language itself, which rules in the depths “as an oral activity,” (ibid, p. 36, emphasis added). Here, “a production of the body [ ] possesses the individual who utters its screams,” and is rejected by society by calling him mad, (ibid., emphasis added). This delirious screaming individual, possessed by the language of bodily pain is the fou littéraire, so long as he (and it usually is a he in the tradition so far) writes it all down. "The Same Other: The Text and Its Translations,” Augusto Ponzio, in Translation Translation, ed. Susan Petrilli.